Making pizza dough can be a little intimidating at first, but once you see how easy it is, you'll make it again and again. You just can't beat it for freshness and flavor. Combine the water, dry yeast, and sugar. Stir until dissolved and set aside. Meanwhile, whisk together the flour and sea salt in a large bowl. Make a well in the center and pour in the yeast mixture. Slowly stir, beginning in the center, working the flour into the yeast mixture until just combined. 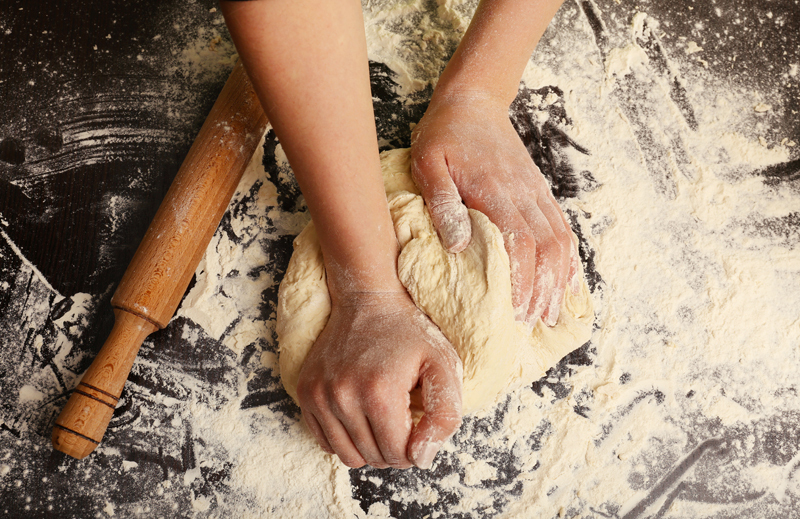 Turn the dough out onto a floured surface and start kneading using the palm of your hand as you push it away from your body. Do this continuously for 8 to 10 minutes, until the dough is smooth. Form a ball and place it in a large lightly oiled bowl. Cover with plastic wrap and set in a warm spot for 1 hour. Remove the plastic wrap and punch down the dough. Roll it out onto a lightly floured surface, and knead it a few more times. Divide the dough into 3 to 4 pieces. Form each one into balls and place them back into the oiled bowl. Cover and set aside for 10 minutes. Your pizza dough is now ready to use! With your fingers and the palm of your hand, gently flatten the ball of dough on a lightly floured surface and form a circle. Sprinkle the top with a thin layer of semolina or cornmeal; just enough to keep it from sticking, then turn it over and place it on a pizza peel or pan. Continue spreading it out with your fingers until you've reached the desired size. Brush the edges of the dough lightly with olive oil, then top it with sauce, followed by all your favorite toppings. Bake at 475° to 500° for approximately 7 to 15 minutes depending on your chosen pizza.